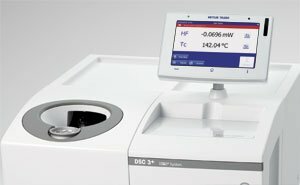 The unrivalled performance and innovative technology of METTLER TOLEDO's Thermal Analysis Excellence Line will propel you to the forefront of your field and guarantee you the highest level of Swiss quality, accuracy and efficiency. In this video, we cover the benefits of thermal analysis, which is also known as TA. Thermal analysis, or TA for short, comprises a group of techniques that measure physical or chemical properties of a sample as a function of temperature or time while it is heated, cooled or held at a constant temperature. This informative video serves as an introduction to METTLER TOLEDO's Excellence and Premium thermal analysis instruments. Thermal analysis plays an important part in our everyday life. Without thermal analysis, we wouldn’t have cars, PET bottles, wind power stations, or modern pharmaceutical products. Even the computer you are using to watch this video would not exist. The Thermal Analysis Excellence instruments allow you to characterize materials over a wide temperature range. Since the early 1960s, thermal analysis has played an important role at METTLER TOLEDO. Technology and innovation were the driving forces that led to the introduction of the legendary TA1 vacuum thermoanalyzer, one of the very first commercial thermal analysis systems. The TA1 was used by NASA together with METTLER TOLEDO precision balances for research in several space programs. to the fast response, high sensitivity and robust, multi-layer ceramic sensors with up to 120 thermocouples used in today’s instruments. Modularity has always been an important feature of METTLER TOLEDO thermal analysis systems. The configuration of the instrument, the different options and sensors, and the modular software concept enable us to offer tailor-made solutions for almost all academic and industrial applications. At METTLER TOLEDO, innovation is an on-going process. Our thermal analysis market support specialists are the link between applications know-how, research and development, and customers. They guarantee that customer support is of the highest possible quality and are the driving force for continuous technical innovation. Innovative Technology, Versatile Modularity and Swiss Quality - Thermal Analysis Excellence is the future of thermal analysis. This video teaches you how to perform a DSC calibration and adjustment using the standard reference substance, indium.